I enjoyed the book. The protagonist, Dusty, is a nightmare. Literally. Yes, that was enough to get my attention. 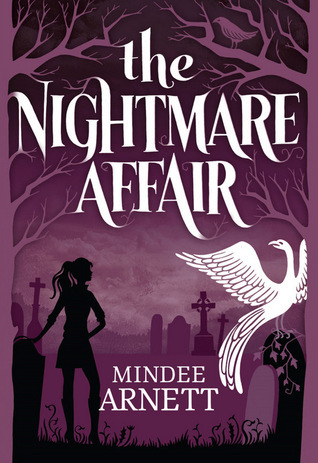 Nightmares feed on dreams of others and one night while feeding on Eli’s dream (the really good looking boy from her previous school) she sees a murder. Things turn really weird when the dream turns out to be real. The killer has to be stopped and Dusty and Eli are the only people who can do anything to help. I really liked Dusty with her witty comebacks and sarcastic remarks. She is immensely likeable. Dusty is trying to move past her mother shadows. Her mother is known in the magic-kind community as a trouble-maker. Dusty doesn’t want to be her mother who left her when she was a child and only came back when Dusty started developing nightmarish(it sounds weird) tendencies. I loved their relationship and want it to be explored more in the next book. Aside from the nightmare concept, the book is not very original. A magical boarding school, murder, there are far too many similarities with Harry Potter and the Philosopher Stone. Especially the ending. The plot had potential but somewhere it just got lost among other things. I still think the author has done a great job with using imagination. I was impressed with the world building. It managed to make me wish that I was in the book. There are also some really interesting characters and concepts. The whole “things becoming animated” (due to constant exposure to magic) idea was brilliant. I would love if my laptop developed a personality. Though the way I treat it sometimes I think it will probably hate me and will shut down at random times just to irritate me. But it will be fun! I liked the romance. Eli and Dusty are adorable together and they made me happy. Though they are not really a couple for the most part of the book. The love triangle was unnecessary and I never really liked Paul. His character needed development. I think the book was entertaining and fun. I enjoyed it for the most part and would love to read the sequel. My worst nightmare was when I was a child and I had a reoccurring nightmare where my friends and I were trapped in a theater and a wicked witch was after us. She only gave us a 10 seconds to run out of the theater, and I fell in the aisle.